The internet has introduced us to many multi-talented creative individuals, and their content has gone a long way to shape the way we interact on the web. 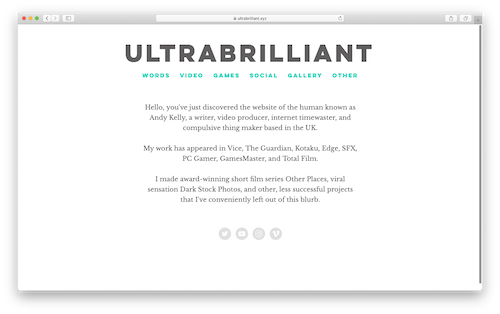 This week’s #WebsiteWednesday is one of those creators, and his personal site is a great collection of his best writing, videos, and art; UltraBrilliant.xyz. Andy Kelly is a gaming writer by trade, penning pieces for Vice, The Guardian, PC Gamer, Kotaku, and Edge. Outside of his professional career, Andy is also a fountain of unique and addicting internet content. Take, for example, his award-winning short film series Other Places which uses the artful scenery in video games to set an atmosphere and convey the game’s story. More of a game player than a watcher? Try Andy’s own game, Derelict, a thrilling interactive science fiction story. Love to kill time on social media? You can’t miss out on Andy’s many Twitter-based creations, from @DarkStockPhotos to the Louis Theroux Bot. From his original writing to his unique use of social media and video games, Andy’s creative mind is truly at one with the current online zeitgeist. Nothing reflects this better than his comprehensive yet perfectly organized personal website. “I’m someone who always has a creative project on the go, but the problem with that is keeping track of them all. So I decided to set up a website as a kind of ‘hub’ for all the nonsense I make. As I keep making things, I’ll continue linking them on the site. It’s basically an ever-growing collection of creative endeavours, including the ones that no one likes, of which there are several. The most fun things to come from the internet arrive via creative people who look at our technology as a tool to tell stories we can all understand and enjoy. Andy is one such person, and his body of unique and endlessly fun work shines as a great inspiration for other artists to aspire to. His personal website shines as well, and is a model of the boundless possibilities you have on your own personal website. From big budget blockbusters to animated TV shows, the amazing level of detail in today’s entertainment is evident nearly everywhere. This increase in ultra-high resolution imagery opens up a whole new world of creativity to artists, but they need to be sure that the graphics they use are top of the line. 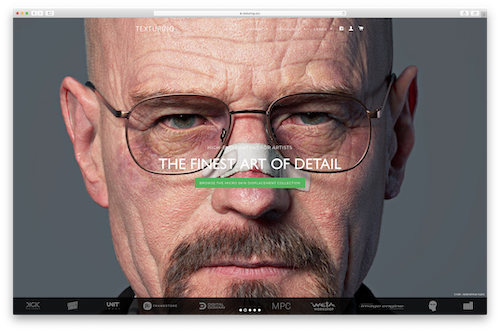 Enter this week’s #WebsiteWednesday, Texturing.xyz. Texturing.xyz is a multi-talented animation and content company that creates top of the line designs and high-res imagery at an affordable price. Texturing.xyz has samples of everything from clothing and fabrics to animals and unique facial features. Their materials are favorites for animators at top studios like Digital Domain and Goodbye Kansas, and you can search Texturing.xyz’s library of sample content easily and find prices for the pieces you’re looking to use right on the site. Providing outstanding animation templates isn’t all Texturing.xyz does, though. If you fancy yourself a talented digital artist, you can submit the work you’ve done using Texturing.xyz’s designs to be featured on their site. Want to improve your abilities as a digital artist? Check out one of Texturing.xyz’s many helpful tutorials. Texturing.xyz even has a blog, which is updated often with behind-the-animation stories from the creators of some of the most impressive images featured on Texturing.xyz’s site. Whether you’re a digital artist looking for new detail templates, an animator eager to improve your skills, or just a fan of great animation curious for a look at how it all gets made, Texturing.xyz has what you’re searching for. Don’t forget, you too can start an amazing journey in animation by taking the first step and getting your own .xyz website! Advertising today is all about getting your brand noticed online. But with so many businesses competing for online ad real estate, it can be tough to get your small or indie business to stand out to the right crowd. If you’re looking to get your message to the creators and developers of the IT crowd at a price you can manage, then you need to link up with this week’s #WebsiteWednesday, MakerAds.xyz. MakerAds.xyz is a unique online ad tool that strikes a beneficial balance between established companies and indie developers. MakerAds.xyz network is made up of paid referrers who integrate MakerAds.xyz’s platform on their site, then allow manually verified ads to run on their page. In exchange, these referrers are part of a redistribution system in which MakerAds.xyz shares 90% of the total earnings with referrers. Larger companies pay to sponsor a limited number of ad spots, and in turn can reach over 50,000 developers and freelancers, giving them a direct line to their ideal audience. 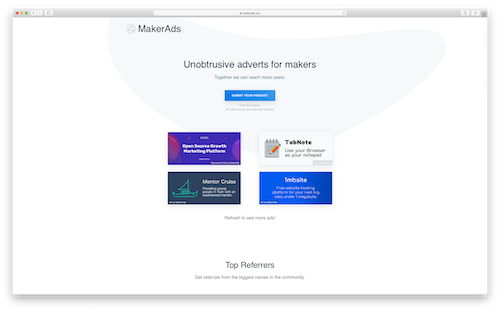 Indie makers can create ads and publish them to the ad network for free, which helps support the indie maker community and creates a more trusting relationship between larger advertisers and the community of makers they are marketing to. MakerAds.xyz comes courtesy of the Squarecat team, who you may remember as the minds behind past #WebsiteWednesday feature LeaveMeAlone.xyz. As indie makers themselves, they know the industry and what it takes to succeed. Now, they are getting larger companies involved directly with that community, and have created an innovative system in which everyone benefits. “The maker community asked for a way to monetise their products with advertising, but without showing visitors irrelevant or ugly ads (or having them served from big bad corporations). Since makers also often struggle with self promotion, we wanted to create something to help solve both problems. Our main goal is to help makers advertise their products whilst also being able to benefit from our generous revenue share program. We have plans to add categories to allow makers to be even more specific about which types of products they would like to be advertising. Finding new ways to grow your your community’s reach helps not only you and the other members, but as MakerAds.xyz shows, can benefit many businesses related to your interest as well. Get all the stats and info behind this inspiring new ad platform on MakerAds.xyz or on their Product Hunt page. Or, create a site for your own indie tech idea with a .xyz domain! One piece of advice many of us have heard since we were children is to “follow our dreams.” But following your dreams means pushing through many obstacles along the way, and sometimes those obstacles can be so intimidating you simply stop pursuing your dreams altogether. The founders of this week’s #WebsiteWednesday never accepted defeat on the path to their dreams, and now they are helping the next generation overcome their fears and push for success: Dare2Dream.xyz. Dare2Dream.xyz is a foundation whose mission is to “improve the quality of life for youth and young adults in order to strengthen our communities both domestically and globally.” It’s founders, Harold “Lefty” Williams and his wife, Shyneefa, know that anything worth having in life is worth working for, and their resilient attitudes have helped them achieve success. Now, they’re committed to teaching that same attitude to today’s youth. Lefty, a star basketball player who once played for the Harlem Globetrotters, didn’t have an easy path to living his dream. Lefty was a standout player in high school and college, but met his share of adversity; transferring colleges his sophomore year to be closer to his mom during her health issues, playing in numerous basketball leagues in the U.S. and abroad when he wasn’t drafted into the NBA after college, and fighting to regain his passion for the game after his grandfather passed away. Despite the hardships, he held onto his dream to play pro and finally made the Globetrotters roster in 2008. His rise to stardom was even chronicled in an exceptional piece by ESPN. Now, Lefty and his wife Shyneefa, who both share the same hard-working, never-say-die attitude, are inspiring kids in the next generation to follow their lead and work hard to achieve their dreams. Through ambassador programs that empower youth and help them develop healthy habits, as well as basketball and fitness camps, Dare2Dream.xyz gives youth the tools they need to push through the obstacles and hardships that stand in the way of their dreams. Dare2Dream.xyz also works closely with Lefty’s basketball team, the Harlem Dreams, which regularly holds charity shows with local organizations and donates 100% of the ticket proceeds to the organizations they are helping. When it came time to spread Dare2Dream’s message of positivity and resilience worldwide via a website, Lefty knew the best way to do it. “I made the Dare2Dream website on a .xyz domain because I’m always looking for something different, and .xyz stands out. I teach my kids the ABCs of basketball, so what’s more perfect than getting a domain that ends in XYZ? Staying focused on your goals and pushing to achieve them in the face of adversity isn’t easy, but it’s one of the most satisfying feelings in life. As Lefty and Shyneefa know, you just need the right attitude to make your dreams a reality. Get inspired by Dare2Dream.xyz by following Lefty and Dare2Dream on Twitter, and dare to follow your dream yourself by getting your own .xyz domain for your website. If you’re an entrepreneur in 2019, you’re likely thinking about how your work or business can reach a global network of potential customers and partners. Fortunately, you can take a tip from this week’s #WebsiteWednesday, NathanGao.xyz. Though based in China, Nathan Gao shows how to leverage your .xyz domain to take your work global. Nathan is a Senior UX Designer at MING Labs, a multi-national design company whose outstanding work has been praised by their many notable clients, including Bosch, Lufthansa, and Mann+Hummel. As for Nathan himself, he has also previously worked on UX/UI design for major clients like McDonald’s, Michael Kors, and Vodafone. His unique artistic approach can be seen on NathanGao.xyz, particularly in the online campaign he helped construct for Sobha Hartland. Sobha is a an ambitious project aiming to build lavish villas and luxury apartments near the Dubai Water Canal, which is surrounded by 2.4 million square feet of greenery. Nathan helped redesign Sobha’s corporate site and added a new UI that enticed businesses and residents to move into the property. Though his company may work in multiple countries around the world, Nathan is able to have his work reach each one thanks to his international .xyz domain and his memorable personal website. Stay up on the latest work from Nathan via his LinkedIn, or follow in his footsteps and get YourName.xyz today.